Unless you are a tiny organization, chances are that you have multiple ongoing projects at any given time. And for large corporations, projects can easily jump into the hundreds. But are those projects actually helping your organization meet its strategic goals? As with most things in life, when it comes to project management, quality is often more important than quantity. Whether you have two projects or two hundred, if your initiatives aren’t aligned with your overall company vision, you are wasting valuable resources. The key is to align and prioritize. 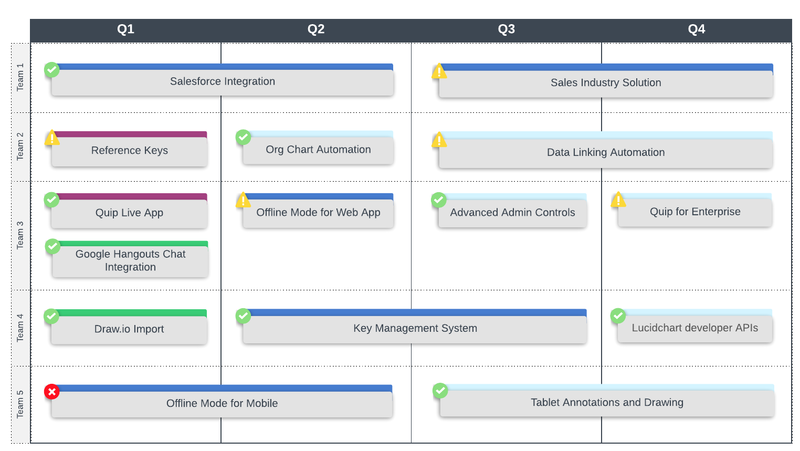 Use Lucidchart to map out your organization’s key strategies so you can easily align projects to your overarching goals. Try it for free today! Why is project alignment important? Project alignment is the process of aligning project initiatives with the strategic goals and vision of an organization. In a survey by the Economist Intelligence Unit, 88% of C-Suite level executives said that executing strategic initiatives successfully would be “essential” or “very important” to the organization’s competitiveness. Yet, 61% of those respondents cited difficulty bridging the gap between strategy and implementation. But what is the real cost of misalignment? Organizations waste $97 million out of every $1 billion invested in project initiatives, reports the Project Management Institute (PMI). The gap between project plans and an organization’s strategic objectives is one reason for this cost. Projects are the way organizations implement strategies. As such, every project should act as a stepping stone towards accomplishing a strategic goal. However, if your projects are not properly aligned with the organization’s strategic initiatives, they are less likely to deliver key benefits that move the organization forward. This results in wasted time, wasted money, and competitive disadvantage. To remain competitive and meet organization-wide objectives, every project should be carefully aligned and prioritized to implement those strategies. How can organizations improve project prioritization? Despite the need for alignment and prioritization, many organizations struggle to identify and pursue the most important projects. In fact, one study found that 68% of organizations worldwide didn’t have a process for prioritization or linking tools to corporate strategy. Obstacles such as miscommunication, lack of high-level leadership, and overwhelming workloads can bury teams in misaligned projects. 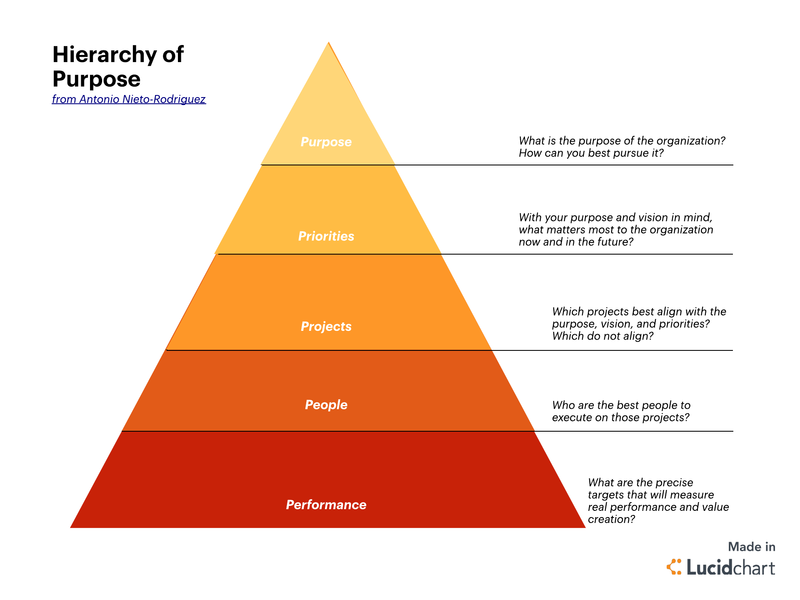 These components make up what project management expert Antonio Nieto-Rodriguez calls the “Hierarchy of Purpose.” When organizations follow this basic process, they are better equipped to set, meet, and adapt to ever-changing priorities. A vision describes what the organization will look like in the future and directs the goals, initiatives, and decisions throughout the company. Every organization should have a documented vision. If you aren’t aware of what yours is, talk to the organization’s leadership and get a copy. As you work towards aligning and prioritizing your projects, keep this vision top of mind. It will focus and direct your efforts as you evaluate each initiative. Once you know where you want to go, you can create a strategy to get there. A strategy breaks down your vision into actionable steps, including high-level projects and initiatives to achieve those goals. In other words, it is your roadmap for success. For example, a growth strategy might involve opening new business locations or building your customer base. Whatever your overarching strategy, be specific in your goals and outlined approach. The better you can define your strategy, the easier it will be to create and prioritize projects to meet those goals. With a clear vision and outlined strategy, you can more effectively prioritize projects that best align with your organizational goals. Here are a few steps you should include in your prioritization process. Before you can prioritize your projects, you need to know exactly what projects are in progress. Take inventory of on-going projects and initiatives across the organization (or your own team or department if you’re a project manager). As you take inventory, evaluate each project and make sure all projects have a clear scope and project plan. This evaluation will help you recognize projects that are on track and well aligned versus projects that are wavering. Keep in mind that not all projects that initially got the OK to launch are worth pursuing. Sometimes it’s better to cut your losses so you can refocus your attention and resources on more meaningful and impactful initiatives. Executives and other organizational leaders should communicate with project managers on strategic goals and help to prioritize initiatives and allocate resources. Successful prioritization allocates resources (time, money, people) in a way that maximizes benefits. But it can be difficult to determine how to allocate your resources when you’re faced with pages of project plans and timelines. To make this process easier, use flowcharts or decision trees to walk you through the process. By visualizing the data and following a prioritization roadmap, you can more easily identify project needs like gaps in alignment and ensure the right people are assigned to the right tasks at the right time. Once you’ve prioritized your project portfolios, use project dashboards to keep projects on track. Dashboards collect important data into quick, at-a-glance visuals and can help you ensure continued strategic alignment. 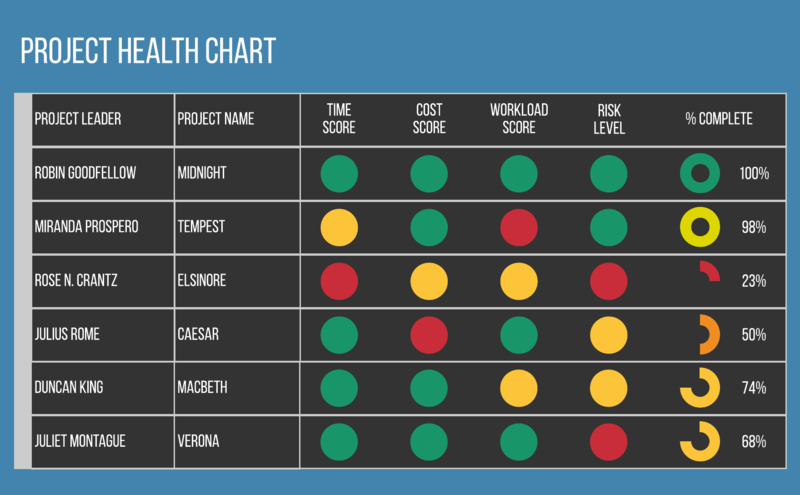 These data and metrics give you the big picture on the current health of a project and help managers identify issues as they arise. Lucidchart’s extensive library of templates and shapes makes it easy for project managers to visualize data and share insights with their teams. Whether you create a chart outlining the organization’s vision, a project roadmap that aligns tasks and strategy, a decision tree to walk you through the prioritization process, or a project dashboard, Lucidchart can help.